We want you to be satisfied with your purchase. Every item we sell is guaranteed to be free of manufacturing defects for a period of 30 days from the date your order is shipped. We will replace, refund or issue credit on merchandise returned in unused condition. Any item you purchase from us may be returned for credit within 30 days of receipt, provided that the item is unused and in re-sellable condition, or is defective in either material or workmanship (subject to our inspection). If you have a problem with your order or an item you received, please fill out a Problem Resolution form. The Problem Resolution form provides the information we need to be sure the transaction is handled correctly. If the return is a result of a manufacturer's defect or our error, we will gladly make arrangements for return at our expense. Returns that are not the result of a manufacturer's defect or error by LittleMachineShop.com must be returned at your expense. All return shipments must be prepaid; we do not accept C.O.D. returns. Enclose one copy of the Return Authorization in the package. All merchandise must be returned in its original packaging. When a product goes on sale or when we reduce the price, we will give you the difference between the price you paid and the sale price in store credit if you purchased the product in the 14 days preceding the sale. Call or email us to request a credit. Check your order upon arrival. Damage must be noted on the delivery receipt. 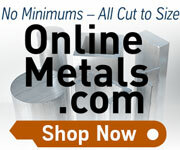 Contact LittleMachineShop.com about any shortage or damage within 7 calendar days of receipt. Please fill out a Problem Resolution form. Backorders seldom happen; our site is designed to prevent them from occurring in most cases. We might hold your order for up to 3 business days to allow backordered items to arrive. If you have requested expedited shipping we will attempt to contact you. If we expect the backordered items to arrive here within 15 business days, we will charge you for the entire order and ship all in-stock items. We will ship the backordered items when they arrive at no additional cost to you. We will notify you of this on your invoice. You can cancel the backordered items and request a refund any time before they ship by sending us an email. If we do not expect to receive the backordered items within 15 business days we will delete them from your order so you are not charged for them. We will notify you of this on your invoice. You can reorder the items when they are again in stock. Prices are in US dollars. All prices are subject to change without notice. Pricing, photographic and typographical errors are subject to correction. All prices are F.O.B. Pasadena, California. These terms and conditions constitute the entire agreement between LittleMachineShop.com and the purchaser, and shall be governed by and construed according to the laws of the State of California and the United States of America. LittleMachineShop.com is a dba of Siechert & Wood, Inc.